The 20-year-old, Australia’s top-ranked amateur for the past 18 months, will leave the world rankings at a career-high No.5 without a professional card, but with a busy 2019 planned as he strives to achieve one or more. Lee hopes to secure exemptions early on the European Tour schedule and will make his professional debut at this week’s Abu Dhabi HSBC Championship, part of the tour’s prestigious Rolex Series. The rhythmic right-hander, who has made no secret of his long-term intention to play in the United States, has also secured a start in the Panama Championship on the Web.Com Tour early in February. It’s hard to peg down a single grand effort in Lee’s glittering amateur career as he has been a standout performer at national and international level for the past three years. The long-hitting Royal Fremantle member, remarkably a six-year state team player for Western Australia, burst to international prominence when he became the first Australian to win the US Boys’ Junior Championship in Tennessee in 2016. Having already played more than a handful of professional tournaments, Lee reached as far as the quarter-finals of the European Tour co-sanctioned World Super 6 Perth last year. He twice was prominent in the Asia-Pacific Amateur Championship and was a key member of several Australian and international teams, including at the World Amateur Teams Championship last year in Ireland, where he was sixth individually. He also played in the Nomura Cup and was a big part of the 2018 Asia-Pacific team that finally wrested the Bonallack Trophy from Europe for the first time in 14 years. “The time is now,” Lee said. “People have been asking me for a little while, but I’ve now proven to myself that I can compete at the highest level and my team and I feel that there are good opportunities ahead. “I got through the first two stages of Web Q-School and narrowly missed my card at final stage, so I’m going to play against the pros knowing that I can already compete. “For that I have a huge thanks to offer to all who’ve helped me reach this stage, especially my coach Ritchie Smith, physio Martin McInnes and strength and conditioning coach Jordan Stares. I also want to thank everyone at Golf Western Australia and the high performance team and others at Golf Australia who’ve all had my back through the past few years. 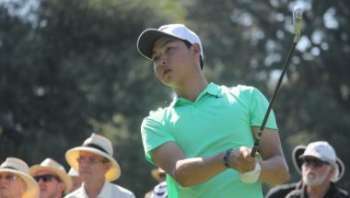 Golf Australia high performance general manager Brad James said Lee, who had been a benchmark athlete during 2018, had been exemplary throughout his amateur career. “We are extremely excited to watch Min Woo transition into his professional career – he’s done some extraordinary things,” James said. “His high performance team in WA have given him some great development opportunities and we are confident he’ll continue to use those learnings and all our support during the transition into professional golf.